I have been a part of many round table discussions on innovation and disruption and noticed that the topic is of interest to many. However, we end up talking solely about technology. We need to remember that technology cannot innovate or disrupt – only humans can! This is the reason which prompted me to select the most pressing topic, ‘Creating people centric organisations in the age of disruption’. Overtime these new entrants will start appealing to the mainstream and high end segments and that’s when disruption happens. For example, ‘Blockbuster’ was in the business of renting home movies and video games through brick and mortar stores since 1985. Their key competitive advantage was that they had access to popular new releases. Netflix entered the market in 1997 without the competitive advantage that Blockbuster had so they adopted a different business model called DVD by mail. Blockbuster did not consider Netflix as serious competition. However, over time Netflix introduced subscription based online streaming and in 2012 moved in to content production. This is when they started appealing to the mainstream. Today they have over 137 million online subscribers in the world. Blockbuster filed for bankruptcy in 2010! This is another point of consideration. The fact that Netflix entered the market in 1997 and Blockbuster filed for bankruptcy only in 2010 proves that disruption is a gradual process. Another example is our very own ‘Pickme,’ a company in Sri Lanka which entered the taxi industry to serve an underserved segment which were three wheelers. Yet, now they have expanded their app to mini cars, cars and vans causing disruption to the entire industry. That should be sufficient examples regarding disruption, instead let us focus on how we can create people centric organisations? An agile mindset is not the answer to the above question as it consists of a mindset which adapts to the current situation. In contrast, an innovative mindset questions the current situation. The fresh thinking that resulted in a company’s success can often be replaced by a rigid devotion to the status quo. The strategic frames will often become blinders, processes and procedures will become routines and values will become dogmas. Therefore, it is important to question the status quo and have more ‘vuja de’ moments! I am certain you are familiar with the term déjà vu, which is the strange familiarity you feel when you do something unfamiliar. In contrast, vuja de is the strange unfamiliarity and freshness that you sense when doing something routine and familiar. It can be a routine thing like ordering a taxi. You stop and think if there could be a better option pertaining to the ordering of a taxi. You question why you need to obtain an insurance for your camera when it is not being used, which results in on-demand insurance policies. These new models emerge as a result of vuja de moments. As an example, ice harvesting was a booming business in the 19th century where people cut blocks of ice and transported them to cities and stored them in ice houses. The 20th century saw ice manufacturing in factories which was the second revolution in ice manufacturing. This was followed by the third revolution which was the invention of the refrigerator where ice manufacturing moved from factories to households. Now it is noteworthy that the Ice harvesters did not become Ice manufacturers and no ice manufacturer invented the refrigerator. At times we get so busy with our core business activity and as a result turn a blind eye to all other opportunities around us. This prompts one to wonder how we could create this innovative mindset. The biggest challenge for an innovative mindset is the architecture of the organisation or simply known as the organisational structure. The 2018 millennial survey by Deloitte revealed that more than 50% of the ‘millennials’ think that the organisation structure in their relevant workplaces are not conducive for the growth of innovative ideas. For example, the Jeff Bezos pizza theory states that if a team cannot be fed with two pizzas, that team is too big. Our teams are often big and they operate in silos. They do not collaborate with each other and do not possess cross pollination to generate new ideas. That is a colossal limitation! 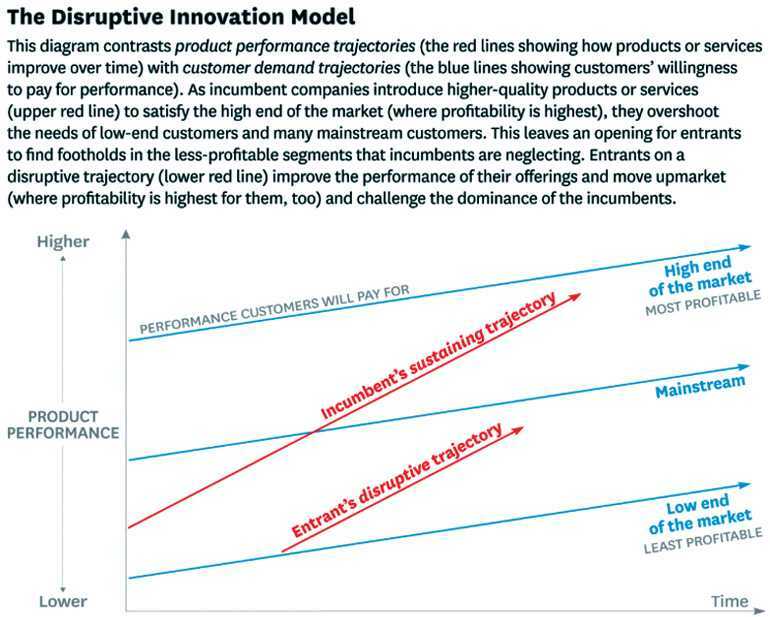 Additionally, looking at innovation as a minimum viable product approach can help. 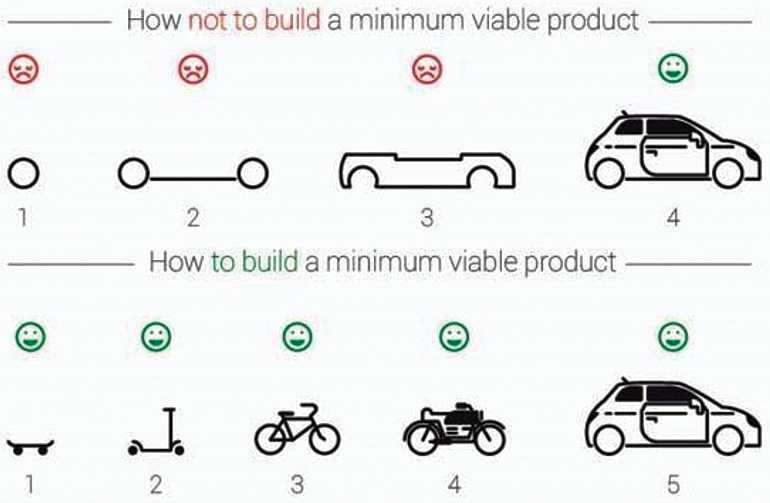 Figure 2 shows how to and how not to build a minimum viable product. In the first set of pictures you see an innovation process where each stage of the innovation process does not add value until you reach the end product. The second example shows a gradual innovation process which adds value at each stage resulting in happy customers and employees right throughout the innovation process. 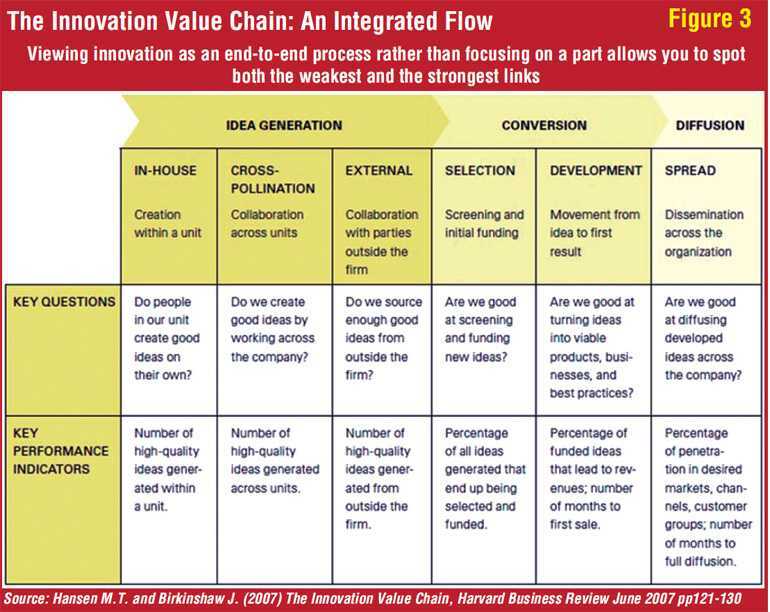 Finally, it is imperative to look at innovation as an end to end process or a value chain as explained in figure 3 (sourced from the Harvard Business Review). This approach helps us identify problems in the innovation process. Sometimes the problem can be in idea generation for some companies and a diffusion for others. This will help you identify your innovation problem. However, to build an organisation wide commitment requires employees to feel that the process of transforming ideas in to a product or service is an integrated process like Porter’s Value Chain which talks about transforming raw material into products and services. The innovation value chain helps you to understand weaknesses in your process of innovation and fix them. I consider the above topic as a personal favourite. Toba Beta, an Indonesian writer, once said, “Greed is a little more than enough!” According to that definition we are all greedy. The constant pursuit of profit has led to financial meltdowns, wars and the extinction of countless species from this planet. The consumerist culture that we have created has caused us to over produce, over consume and over heat this planet. Moreover, we need to understand the negative consequences of our actions and start correcting them. That is an important responsibility of all marketers. Many organisations have realised this and they are defining the purpose of their existence which is going beyond making profits. It is stated that the purpose of business is to make life better in a profitable way. Many successful businesses define their purpose. When Dunkin Doughnuts say their vision is to serve delicious coffee and doughnuts, Starbuck says they want to inspire and nurture the human spirit. Two companies in the same industry; one defines what they do and the other defines why they exist. Why is purpose important? All stakeholders in an organisation today, prefer to work with purpose driven organisations. The millennial employees are more engaged, and three times more likely to remain in purpose driven organisations, customers are willing to pay a premium price and switch from competitors and even shareholders see a link between purpose driven organisations and business growth. Therefore, purposeful organisations are said to thrive. The following is an example of a purpose-driven organisation. Toms is a designer and manufacturer of shoes. Their purpose was ‘Improving Lives’. For every pair of shoes purchased from Toms worldwide, Toms donated a free pair of shoes to a needy child. This was a powerful purpose which appealed to all stakeholders. The company saw their revenues growing at CAGR of 79% from 2010 to 2015. However, they are struggling financially today. Toms unfortunately did not innovate. They have been selling the “Alpargata design” from inception and did not produce innovative designs. Reflecting on the initial definition of the purpose of business – it is to make the life of all stakeholders better – not merely your customer, shareholder, employee or any individual stakeholder. All stakeholders should see value in our purpose and they need to be inspired by that purpose. Unfortunately Toms customers no longer saw value. So they started disconnecting from the purpose. We sometimes spend more time in articulating nice purpose statements but spend very little time converting them to actionable behaviour. As a result your customers experience does not align with what you promise them. The best example is United Airlines. Their purpose was ‘Connecting People and Uniting the World’. However customers did not experience this purpose in their service encounters. There were many complaints where customers were badly treated by employees which went viral- creating a negative outlook. So the first step is to align your employee experience with the customer experience. Another example is Odel, a leading fashion retailer in Sri Lanka. I worked as the Manager Customer Service and Loyalty at Odel a few years ago. We promised to provide our customers a ‘Mind, Body and Soul’ experience. However, we knew that before we provide this experience to the customer we need to provide a ‘Mind, Body and Soul’ experience to our employees. We designed a program called Champions of Service and Inspiration (CSI) and selected staff who gave the customers an exceptional service. We recognised them, gave them certificates and trained them on the basics of customer service. We even developed a Greeter card in order to train them in greeting customers in various languages. Subsequently, we created a career path for them. A CSI was entitled to become a Fast-tracker in a year, enabling these youth to become a supervisor and climb up the corporate ladder to eventually attain the title of CEO of the company. This helped us to align the employee experience with the ‘Mind, Body and Soul’ experience of our customers. Sometimes we are overwhelmed with technological trends that we forget to get the basics right. There are speculations that 50% of our jobs will be replaced by robots in 2030. These speculations create concerns of job security and people get distracted. First and foremost, we need to address this concern and it is illustrated further through a conversation which took place between Henry Ford II, the famous automobile manufacturer and Walter Reuther – President of the Automobile Workers Union. They took a tour of a newly built and highly-automated factory operated by robots. We need to remind ourselves that we need people to buy the products and services that we manufacture. Therefore, however much we automate, there will always be more job opportunities created for humans. If not this eco system will fail. Going back to basics is vital. A recent survey done by InMoment listed factors that affect lacklustre brand experiences. They interviewed not only consumers but also companies which produced the brands. Close to 75% of the consumers said that poor interaction with staff is the biggest reason for poor brand experience. But only 29% of the companies which produced brands thought that interaction with staff is a reason. This shows the disconnect between the consumer and the brand. Brands are more concerned over AI, Virtual Reality and other trending topics and ignore basic customer service. The same study revealed that consumers have ranked human interaction and being treated well as the most valuable and memorable factors in brand experiences. Similarly a recent PWC report also revealed that close to 75% of Millennials prefer a customer service representative over a Chatbot or Interactive Voice Response (IVR) when contacting an organisation. This need would emerge more in the future as people will increasingly value human experiences as a result of spending more time with devices. Stepping up in the hour of need will help us be a responsible corporate citizen – a truly people centric organisation that is genuinely concerned about people. This should not be mixed up with purpose as purpose is broader and stepping up is more situational. 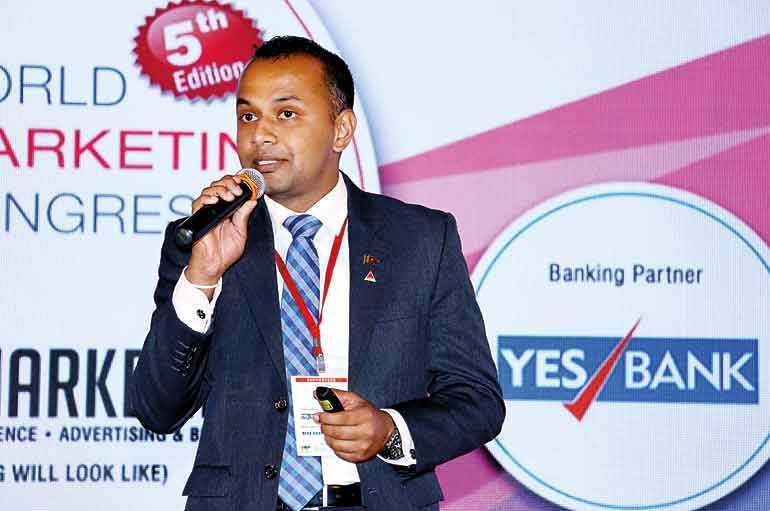 I will share two case studies from Sri Lanka. The business capital Colombo and its suburbs were affected by floods in 2016 and many people were stranded due to this. PickMe updated a SOS feature into their app and informed their customers to use the feature if they needed help. PickMe deployed boats to rescue these customers and in some instances alerted the Disaster Management Centre when they were faced with limitations. This was an ideal opportunity for the company to use the commercial platform to create a positive impact. In April 2018, farmers faced an unexpected excess in their pumpkin harvest and found themselves in a predicament where they could not sell a kilo of pumpkin for even Rs. 7 or 8. Hearing these farmers’ cry for help, Cargills Food City stepped forward to assist them. They bought the pumpkins at Rs. 20 kg and sold it through their distribution network. What happened next was inspiring. Sri Lankans stepped in and started a movement titled, #pumpkinchallenge2018. This went viral and people around the nation embraced the situation and supported it. When creating positive social value becomes your everyday business, customers and all other stakeholders will support your organisation to thrive. This will inevitably lead to success and become a blessing. What do you think is more innovative, diverse and unique – rainforests or plantations? The answer would be rainforests as they operate in a 100% self-sustainable eco system. They can survive for centuries without human intervention. Human intervention can only destroy rainforests. The secret to this is that rainforests allow any plant to grow. But plantations are very selective. If it is a tea plantation only tea is allowed to grow. Every other plant is considered a weed and removed from the plantation. My question to you is whether your organisations look like rainforests or plantations. Do we allow new ideas and people to grow and prosper or do we remove them saying they are inappropriate? Think about it. If you want your organisation to thrive and exist for a long period of time, it is necessary to make them into rainforests and create a conducive environment for people and ideas to grow.